"Salsa is in my DNA": A Conversation With Kianí Medina | IBA Boston | Inquilinos Boricuas en Acción empowers and engages individuals and families to improve their lives through high-quality affordable housing, education, and arts programs. 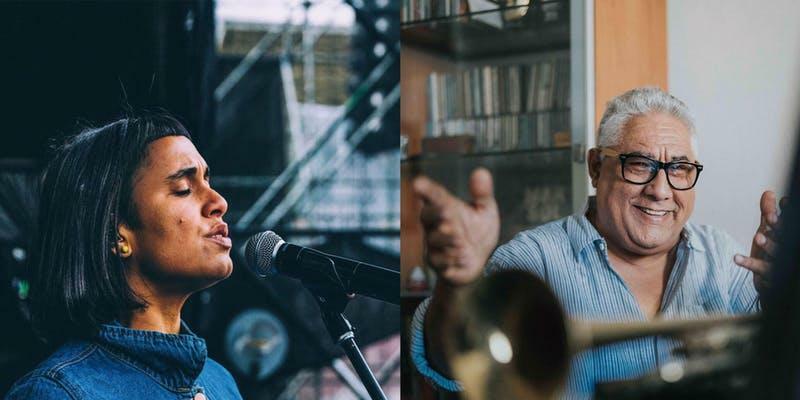 We are thrilled to host both of these world-renowned Puerto Rican musicians as they take you on a journey through their experiences in salsa and beyond on Wednesday, February 27 (details below). In advance of this performance, we had the privilege of sitting down with Kianí and chatting about life, music, and what to expect from this concert. Q: Tell me about working with, creating music with, and performing with your father. What’s that like? A: It’s always very special. It means a lot to me to be able to make music with him and create with him, because he’s not only my father but my biggest inspiration in music. We are both singers—he started 40 years ago, and I grew up in that environment. I’ve never wanted to do anything else but sing. Q: What makes you want to share your voice with others? How does it make you feel? A: Singing is the most important thing in my life. I can just go places with the music, which is a feeling I don’t get with anything else. It’s magical what it does to you. There could be a million things wrong, and the moment I take the microphone, everything goes away. There’s a beautiful energy I get from the people when I sing, every time I sing, no matter what genre. It’s what I’d call retroalimentativa—their energy feeds into me and mine feeds back into them. It’s an atmosphere of complete harmony. Q: Your concert has been described as a “journey through experience in salsa.” How has salsa shaped your life and your work? A: Salsa has always been there; I’ve been listening since I was in my mother’s womb! My father was in a salsa group called Batacumbele that mixed all sorts of rhythms. He also played and recorded with Eddie Palmieri, a gifted pianist, bandleader, and composer who is my biggest inspiration in salsa. Salsa is in my DNA—it’s my heartbeat. Q: How does your identity as a Puerto Rican woman feed into this performance? A: While salsa is our heart, we’ve planned an eclectic performance. We’ll be playing around with various rhythms, mixing in local Afro-Antillean beats with blues, jazz, and salsa. I also try to always include compositions by Puerto Rican female composers such as Sylvia Rexach, who is my biggest inspiration as a woman and composer. Q: What’s next for you and your voice? A: My next important step is to finish my first album! I’m 32, and I’ve been singing professionally since I was 16. Having sung with many bands, collected so many experiences, and grown through all of it, I feel confident and ready to do it! I’ve been recording so hopefully this year you will hear of it! Q: I heard that IBA asked you to do this show while in Boston on tour with Residente. What about IBA’s mission made you say yes? A: I think the work that they are doing is very positive. I love that the organization is always supporting Puerto Ricans, offering this platform for the arts, and providing tools to the local community. I am thrilled and honored to be doing this show for them. You can see Kianí Medina perform alongside her father Jerry in their upcoming concert, Traigo de Todo (I Bring Everything) on Wednesday, February 27 at 7:30pm. The concert will be held at OBERON American Repertory Theater at 2 Arrow St in Cambridge, MA. Tickets are $20, and can be purchased here.